Because it was Earth Day, root vegetables so directly connected to the Earth seemed a great inspiration..
First, start by sauteeing the onion and celery in olive oil in a heavy soup pot. 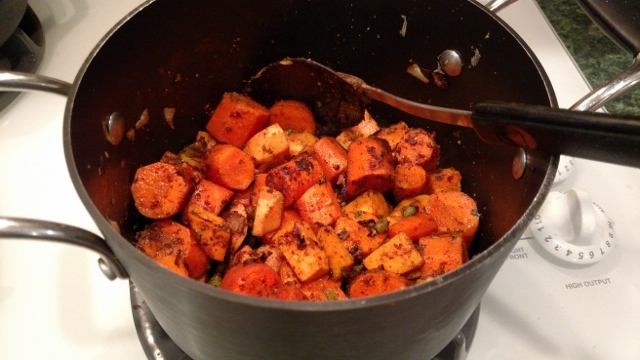 Add the carrots and sweet potato, and all spices and ginger. Toss in extra olive oil if needed to prevent sticking. Heat the vegetables and spices through. This way of heating through the spices helps release their flavors, it kind of toasts the spices. Next, add enough filtered water to cover the vegetables. Add 10-12 oz. chicken or vegetable broth. Simmer with cover on for about 40 minutes until the vegetables are cooked. 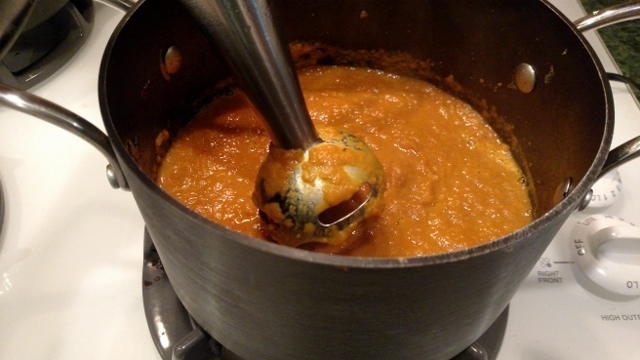 After the vegetables are cooked, use the immersion blender in the pot to puree the soup. Serve in bowls with a fresh parsley or cilantro garnish. OR- this also makes a great "appetizer" soup as those little "shots" of soup for a clever first course buffet or dinner party. That list of ingredients for this recipe may seem onerous, but substitutions are easily made--no coriander, do you have cilantro fresh or dried flakes? No cardamom- ok to omit. No fresh ginger, OK to substitute ground ginger. Of course, you already know the way to have ginger root always available is to store in the freezer--it's easier to shred when frozen too! Also--the issue of chili powder--here we have a whole spectrum of possibilities. Do you want flavor or heat? I am not a "heat" person so I usually sprinkle in standard mild-medium chili powder blend whereas true Indian red chili powder is extraordinarily hot so you must use caution in amounts until you know what amounts will satisfy the effect you are trying to achieve. 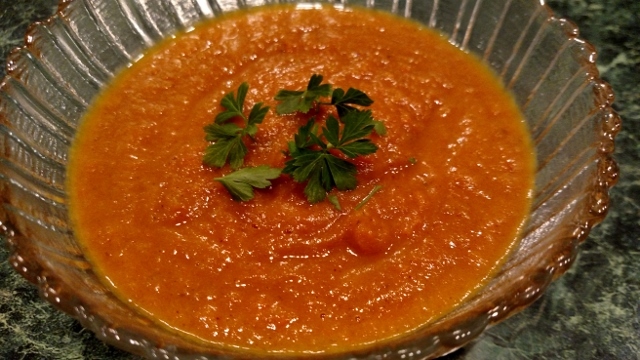 Which leads me to a final point--you can certainly make this carrot soup have a completely different flavor profile, with still savory seasoning ! Instead of Inidan spices. how about trying herbs de Provence blend and thyme? It will also produce a beautiful and fragrant soup, also quite savory but completely different. Happy Earth Day 2016 (if belated)! But then, we should plan to celebrate our planet Earth everyday! A new Spring has arrived and thanks to our excellent distribution of fresh vegetables around the country, we are already able to find a bounty of fresh broccoli, Brussel sprouts, cabbage, kale and cauliflower in our groceries. I even came across a great sale on gorgeous cauliflower heads. These early "cruciferous" vegetables have several health benefits. Their attributes include: high fiber for digestive support, low carbohydrate content, detoxifying and antioxidant properties which may contribute to the interest in possible anticancer effects and nutritional support with high amounts of vitamins C, K, folate, beta-carotene and trace minerals. They also are relatively high in protein. Cruciferous vegetables are a "pharmafood." But there are also some caveats, they contain enzymes that may interfere with iodine uptake (not a problem if you are using iodine supplemented salt). And, the de-toxifying properties are good for helping to rid your body of toxins, like cancer causing aflatoxins that you don't want, but not good for some prescription drugs which may also become less bioavailable. Consult your doctor or pharmacist if you have a question about your prescription drugs. So while we would like to eat more vegetables and these are among the best choices, unfortunately, they are not the most exciting vegetables to eat. Who doesn't get a bit tired of seeing broccoli and cauliflower florets on a tray with vegetable dip? Even kale chips are getting old. 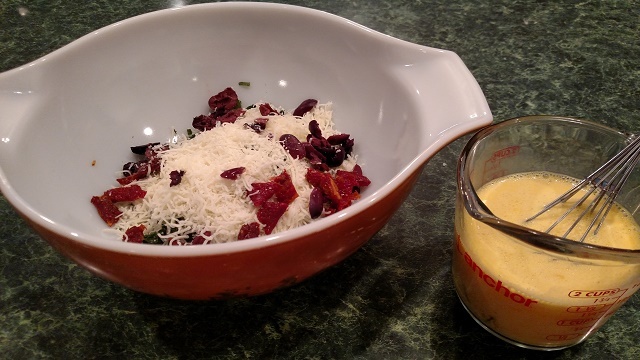 Broccoli and cheese or Hollandaise sauce is still an OK go-to. But it is time to think a bit out of the box. Rough cut Brussel Sprouts- about 2 cups when cut up.Steam Brussel sprouts until just crisp-tender or you can boil in water and then drain. Don't let them get mushy. 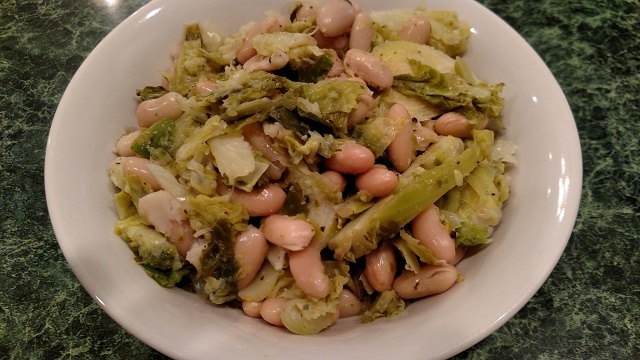 In a large bowl, add cooked Brussel sprouts and 1 can of rinsed and drained cannellini beans. Liberally sprinkle with dried Italian herb blend. Salt and ground pepper to taste. Toss with lemon juice and olive oil. Serve hot, room temperature, or refrigerate and use as a side salad. It looks like a yummy bowl of polenta or grits and cheese. doesn't it? I would suggest you can use this where you might have considered either one of those side dishes. Wouldn't some short ribs look nice tucked into the side of that cauliflower in a large dinner bowl? Or some grilled chicken thighs? Yet, this is so delicious, a bowl can make its own meal--who says you can't eat vegetables for breakfast? Clean and cut up 1 large head of Cauliflower. Boil pieces in water until tender. Drain thoroughly and mash the cauliflower. Add 1 can of Cream of Chicken soup which has been diluted with 1 can of water. (You can also try this with cram of celery or other). Add extra seasonings: salt, ground pepper, thyme, onion powder and garlic powder to taste. Serve as a side or alone. Garnish with fresh parsley. Honestly. this is so good you will get your elderly mother to eat her vegetables! 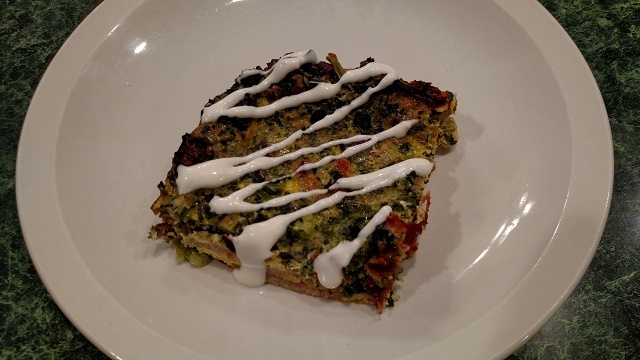 Step-by-Step Quick and Savory Vegetable "Quiche"
Who doesn't love a QUICKLY made, lower carb, SAVORY vegetable quiche? 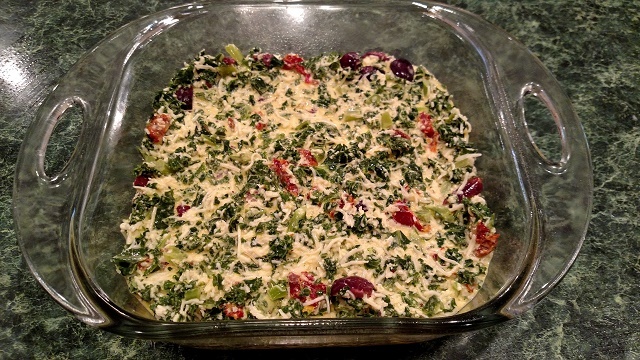 We often fail to make a quiche dish because we don't have time to prepare a pie crust base. So, we might choose a strata, but then resist because we don't want all that bread as the base. 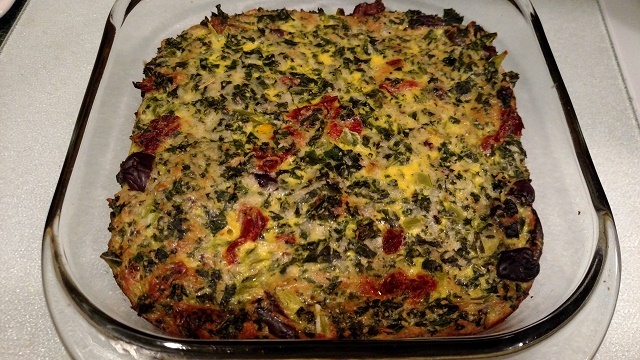 We may be trying to save carbohydrate calories but just don't want to go with the crustless quiche. So, here's a suggestion. Make a quick quiche by using a minimal amount of bread base, using 2 "Sandwich Thins", the thin convenience "bun" that is readily available (in your freezer right now, perhaps?). I once met a physician whose specialty was the first cranial nerve--seriously, the OLFACTORY nerve. There are many conditions that affect the sense of smell and he was an authority on these, but one piece of his research was particularly interesting. It was a small study but with interesting initial findings. The research suggested that if you inhale intensely savory (or intensely sweet) odors while eating a food for which savory would be appropriate--you are "sated" earlier--meaning you fill up faster. So eating foods that intensify the fragrances of the food, by choice of food, seasonings, herbs, etc--might theoretically fill you up more easily. Maybe that explains why you can get filled up on smaller portion sizes of "rich" French foods, known for their excellent savory and perfected sauces. In any case, you are more likely to ENJOY well seasoned and savory foods than bland, one-dimensional food. Build your "Savory Vegetable Quiche". Start with a lightly oiled 8x8 inch glass pan. Separate the 2 "thin" buns into a total of 4 slices and place in the bottom of the pan, overlapping if needed to fit in. season with more savory dried herbs-I used herbs de Provence and freshly ground pepper--with kale you might also choose nutmeg and thyme. 5. 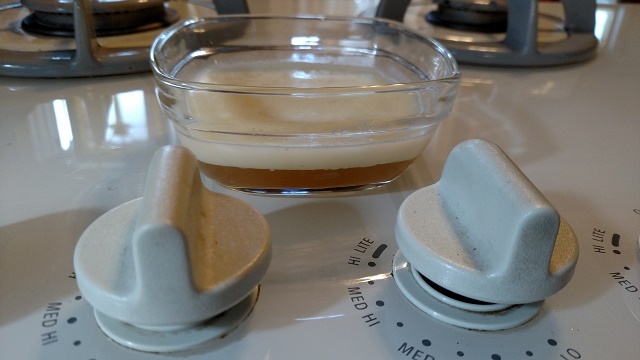 In a 2 cup measuring cup, beat together 4 large eggs and then add enough milk to the eggs to make 1 and 1/2 cups	of total volume and whisk together. 6. 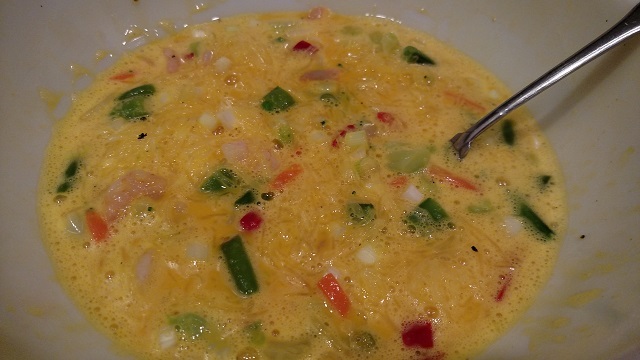 Add to the vegetable and cheese mixture, blend together. 7. 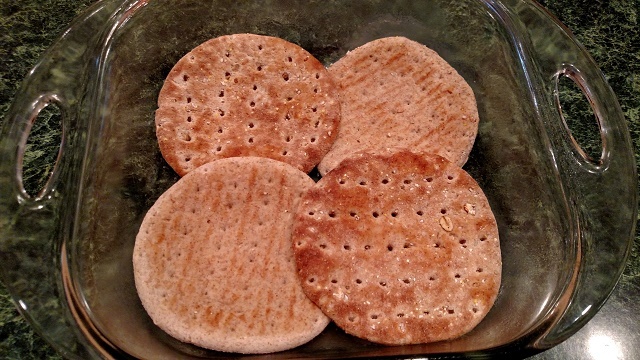 Pour over the sandwich thins. 8. Bake for 50-55 minutes until eggs are completely set. 9. Cool about 5 minutes. 10. Cut into 4 slices and serve. 11. Finally, you can drizzle a little more "savory" by using a premade blue cheese or Ranch or Thousand Island drizzzle across the top, especially nice with the greens in the quiche. I drizzled a little blue cheese dressing over my slice in the picture at the beginning of this post. Hopefully, you'll give this quick quiche a try, intensify the SAVORY and see what you think! 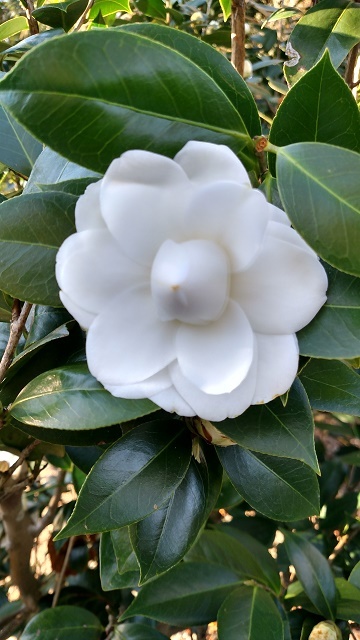 I recently visited my mother who lives in sunny Florida, where they are blessed with the kind of weather that lets you grow flowers, plants and vegetables year around. It's always green Just being there in February makes you smile—to see palm trees and grass as soon as you de-plane. And check out the Spanish moss in the trees in the picture below. 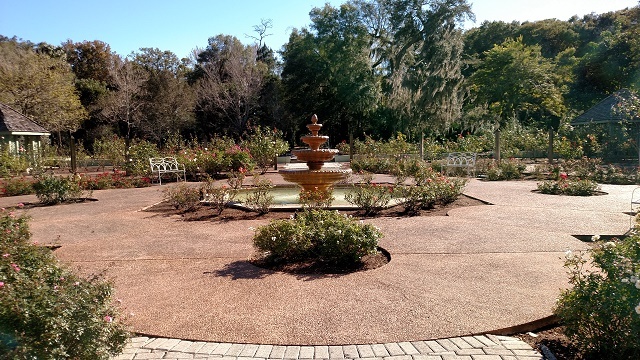 One thing I always like to do when visiting is to make a trip to Harry P. Leu Gardens in Orlando. It is a beautiful property with many formal gardens and wallking paths and the restored original homestead house in all its glory. Part of the gardens around the house includes a kitchen garden where I always get fresh ideas. This year I found myself enamoured with the Leu Kitchen Garden “Pallet” garden plantings. 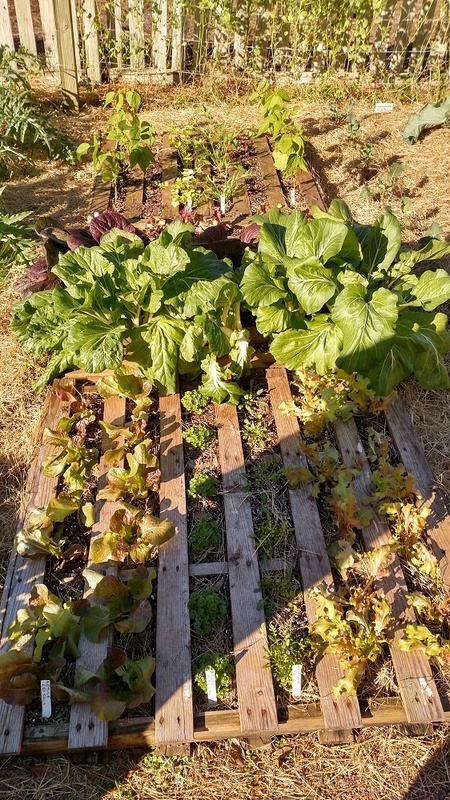 What a great idea to plant vegetables with fairly straight stems and shallow-ish root systems in between the wooden slats of a pallet. Lettuce greens are thought to be very successful, and I can see spinach, Swiss chard, kale—all happy using this method. I am also considering beets and carrots, planting then with appropriately loosened soil and then using the “seed tapes” that would seem pretty simple to lay out and cover. You do have to prep the area in which you want the pallet garden to grow. The soil should be tilled and broken up and compost added. One of my biggest problems in my usual garden is the invasion of weed seeds and invasive grasses during the growing season. Those weed seeds are in the soil now, just waiting...It's impossible for me to keep up weed control by pulling or hoeing and I don't want to apply herbicides ever. So, this year, I am going to put down heavy black tarps in the areas I am designating for the pallets. I have at least 2and ½ months before I can plant in my zone. So, the black tarps will heat up during the day and destroy the weed seeds and developing plants. When I plant my intended seeds, the wood between the rows should prevent weeds between the rows. And if I plant the garden correctly, the plants will fill up the open rows, choking out weeds. Well, that's my goal anyway for this part of the kitchen garden, otherwise to be known as my “pallet of vegetables” garden. Red Meat is Good for You!!! Want a Healthy Diet? Don't give up on RED MEAT! Sometimes the best intentioned people make mistakes. And if they have the power to influence huge numbers, those mistakes can affect entire populations. If others simply repeat the misinformation without considering the evidence for themselves, they can erroneously affect the health and well-being of others, something that's in conflict with what they intend. Various health advisors have instructed you to avoid red meat--beef and lamb--and eggs, stating changing your diet this way will make you healthier and lower your cholesterol, so people started to eat more fruits and vegetables and avoid eggs and red meat and choose chicken. How many times have you heard it said that skinless poultry is the way to go to lose weight and drop your cholesterol levels? This advice has been going on for years and for the last decade especially, our political leaders have directly influenced the diet of Americans by actively promoting more fruit and vegetable and grain intake, even approving multiple, genetically modified foods in order to assure the market is saturated with these commodoties. Their claim? “They're healthier.” But how are fruits and vegetables and skinless poultry deemed to be healthier? They are promoted as such because they have less saturated fat than red meat and are generally lower in calories by weight. But the excess carbohydrates in fruits and grains have made us an obese population with diabetes, and ironically high cholesterol and triglyceride levels. The response from the pundits is to double-down and blame the entire population for over-eating and not exercising . It's true we DO take is excess calories and we lead sedentary lifestyles, but the current popularly promoted diet high in fruits, vegetables, and grains isn't sufficient to make us healthy. What are you MISSING if you stick to a diet without red meat (beef and lamb)? You are missing the best natural sources of B vitamins, in particular B12, something that is NOT naturally provided in fruits and vegetables or grains. Vitamin B12 is a necessary nutrient for red blood cells, nerve cells and DNA in all cells. So, deficiencies of Vitamin B12 can cause anemia, peripheral neuropathies, and dementia, but it's often suspected to be involved in multiple neuropsychiatric conditions because it's needed for cell repair and regeneration. While you don't need a lot of B12 daily to avoid these consequences, a stricly vegetarian diet is clearly deficient. A vegan diet absolutely must be supplemented. And if your only meat source is poultry—guess what—POULTRY is a very poor source of B12. As we age, absorption of vitamins taken orally is further diminished. Also absoprtion of B12 is limited by many commonly used drugs (like metformin and all antacids and proton pump inhibitors). Red meat--beef and lamb--is the best natural dietary source of B12 (and other vitamins: thiamine, riboflavin, niacin, folate, pantothenic acid, B6, vitamin D). Fish is also a good source of B12, but we are often limited in our intake of fish by access and mercury levels. Milk and eggs also contain B12, though to a lesser amount. It would be great if people felt comfortable eating red meat. So, back to the original reason people advised against red meat: saturated fat. You may want to further eliminate saturated fats and your doctor may be advising it for your personal medical conditions. And, since you probably know its only the saturated fats that are potentially of health concern, you'd possibly feel more comfortable if you could have red meat without excess saturated fat. It's so simple to get rid of excess saturated fat in red meat! 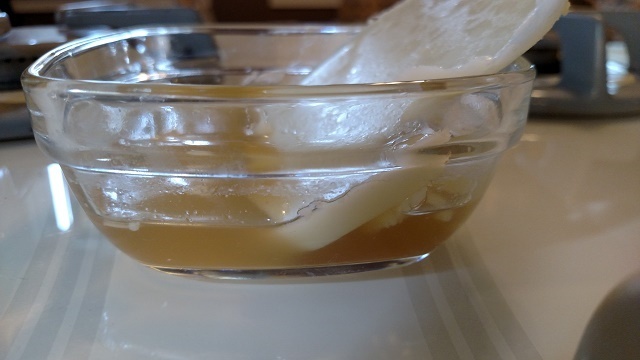 Saturated fat liquifies with heating, then solidifies at room temperature! 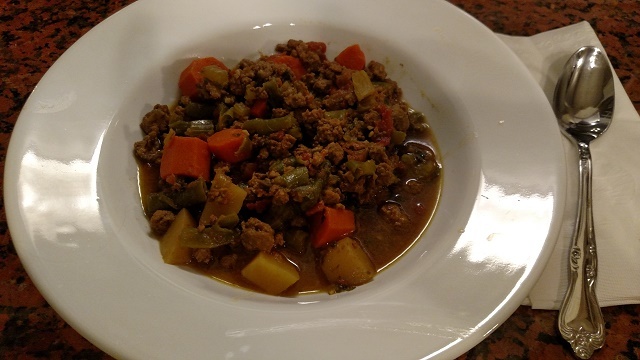 I am making an Indian stew with ground lamb today. It's loaded with healthy Indian spices, tomatoes, onions, and lamb. So, I would like to remove excess saturated fat from the lamb for today's post. First I browned 2 lbs. of ground lamb. It's grassfed so I am expecting proportionally less, but I want to make the point of trying to remove even more saturated fat. After cooking the 2 lbs of red meat in a skillet, I drained all liquid into a small pyrex dish. Saturated fat will quickly separate and harden as the liquids cools down to room temperature. Here's the dish about 45 minutes later. Then, just take a spoon and lift the edge of the block of saturated fat and discard it. The rest of that beautiful stock, and its liquid unsaturated fats,is going right into the stew pot! Please reconsider your diet and learn a simple technique to remove excess saturated fat from red meat, without sacrificing all the essential B vitamins and Vitamin D you would lose if you eliminate red meat from your diet! (And if you don't include red meat in your diet, you better be taking a good source of these vitamins—AND please be sure to consult your doctor if you might have a dietary or an absoprtion problem. They're called “vitamins” because they are “vital”). Brown and throughly cook ground turkey. Poutry need to be cooked to 165 degrees remember, so use a high heat and get it browned. Add taco seasoning dry mix and water as directed on package. Add diced tomatoes,chilies and the liquid, and 1/2 of the black beans. Layer 1 tortilla on the bottom of the casserole dish Follow with 1/3 of the meat mixture, and 1 oz. shredded cheese. Repeat for two more layers, like you are creating a lasagne. 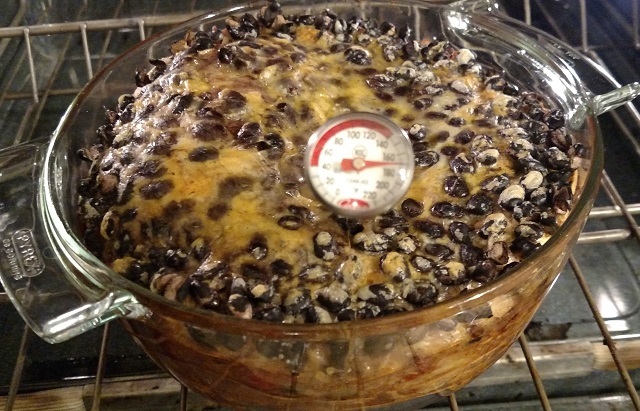 Then top with the 4th tortilla and remaining cheese and remaining 1/2 of black beans. You can bake the caaserole now at 350 degrees for 45 minutes . Let rest about 5 minutes, slice into 4 servings and plate with a good green salad. OR--you can promptly cover and refrigerate and bake the next day. IF you choose this route, then you have to remember the food safety rule for: Previously Heated Foods. First, cover and promptly refrigerate the assembled casserole. Third, the internal temperature for previously heated foods is 165 degrees or greater. So, here's a picture of the refrigerated casserole after 45 minutes at 350 degrees. It looks "done" but see the temperature? It's not even close to 165 degrees! 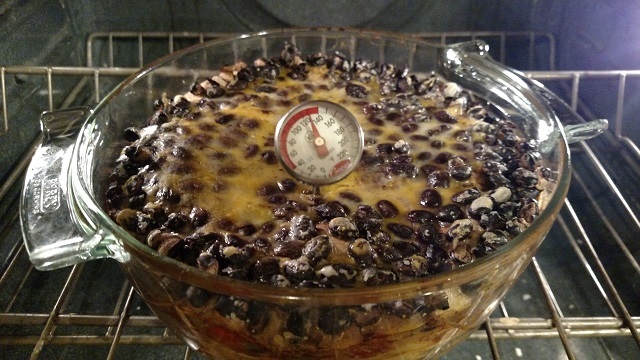 The lesson here is to remember to use your thermometer to verify the internal temperature, and do not rely only on suggested baking times, especially if you are baking from refrigerated or frozen states. AND--remember that previously heated foods are their own category and the temperature needs to be above 165 degrees for food safety. We've all gained too much weight, because of our excesses. We need to seriously look at discarding some of those excesses and, it's true, the only way you can lose fat is to eliminate carbohydrates. Meaning, we have nutritional needs that indicate we have to take in enough protein to make new cells and correct micronutirents and vitmains to permit needed biochemical reactions. But we all eat too many carbohydrates that are really only needed for immediate energy,and if immediate energy isn't called for, then the carbohydrates are efficiently stored as fat. That's an evolutionary reality. Do you assess yourself as having too much stored fat? Is your belly bulging? When you lie down, does fat protrude above your pelivs? Or in very commensense terms—do your clothes from last year now seen—too tight? When you look in the mirror with your arms outstretched, are there fat pads hanging? Sideways, does your abdomen protrude? That's too much fat. And the only way to loose it, is to eliminate unesceassary calories that are carbohydrates. Here's a trio of ideas for the Bleak Midwinter--that meet nutritional needs, but cut the carbohydrates a bit. Prep the crockpot with oil. Mix together and cook on LOW for 8-10 hours. 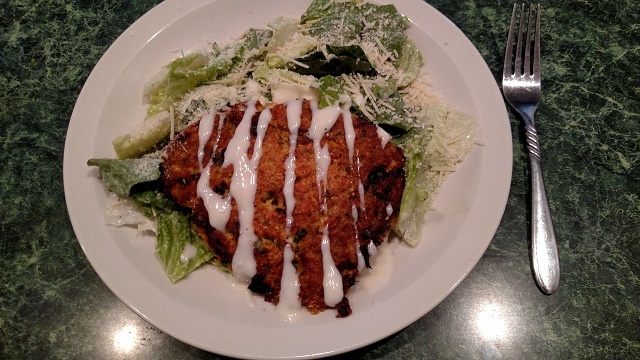 Who doesn't love Salmon Patties over a Romaine lettuce salad? Combine above , then divide into 4 patties. Fry in olive oil. The egg will “bind” the patties, but if you favor extra “crunch”, lightly dust both sides of the patties before frying, with corn flake crumbs. Serve over Romaine with lemon juice, drizzle with dill sauce, a little hard cheese? Brown 12-16 oz. ground turkey, add 1 green pepper, diced and ½ small onion and cook through. 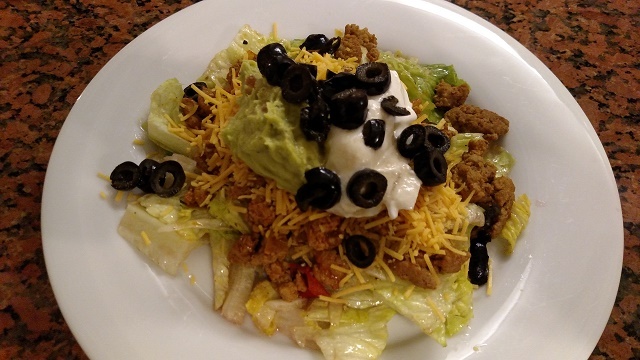 Use 1 packet of a low carb taco seasoning mix, and water as directed to prepare the turkey taco. Meanwhile, dress Romaine lettuce with olive oil and vinegar dressing and plate. Add a bit of shredded Mexican cheese and a dollop each Plain Yogurt and guacamole on top. Add some chopped black olives, if desired. 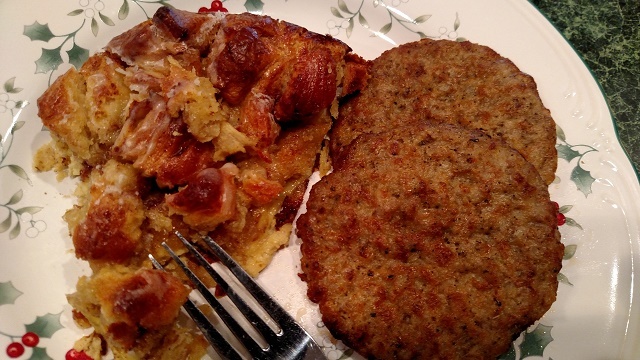 Embrace the low carb and see a few pounds, depending upon your zeal, of fat disperse. To lose fat, it only requires some strict elimination of carbohydrates, NOT elimination of essential protein and micronutrients. You've made more than one roast turkey or roast beef this holiday season, I'm sure. And you might find yourself doing another roast with all the trimmings, making more food than you need for one meal. Likely your refrigerator is loaded with plates of leftovers. 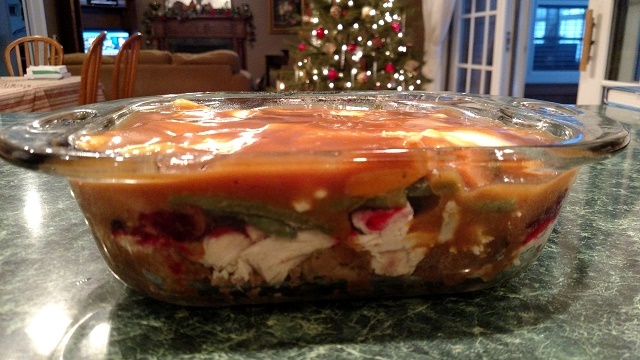 With holiday meals, you have quite an assortment of leftovers, right? That makes a baked casserole a likely plan. Layer stuffing, turkey pieces, mashed potatoes, sweet potatoes, green beans and slide a bit of cranberry sauce in between somewhere. Then cover everything with turkey gravy. Once assembled, it will look something like the picture above. Then cover the pan with aluminum foil and bake at 350 degrees until internal temperature is 165 degrees, about 45 min to an hour depending on the thickness of your layers and size of plan. Remove to counter, remove the foil, allow to rest another 5-10 minutes and scoop generously for a pleasant casserole brunch. In the photo below, I used cubed turkey, mixed with green chilies, mild enchilada sauce, Mexican blend shredded cheese and Spanish rice. 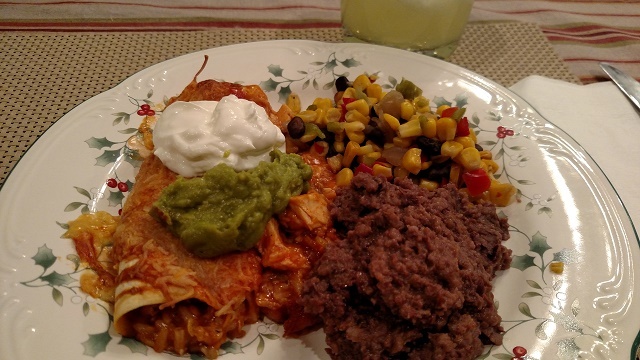 Roll into flour tortillas, top with additional enchilada sauce and cheese. Bake at 350 degrees until internal temperature is 165 degrees. Finally, I know you will be craving a sweet breakfast that's easy to prep and serve. A decadent recipe for Cinnamon Roll Bake has been circulating on the internet this season. It looks fantastic, but it is way too sweet and syrup-y for most of us as the original recipe was written. The portion sizes are also too big for the New Year resolutions. Cinnamon Roll Bake -adjusted portion and carbs. Start with 8in X 8 in baking pan, 350 degrees preheated oven. On the bottom of the baking pan, 2 Tbsp butter, melted. 1 can of flaky Cinnamon rolls- remove and set aside the frosting. Separate the 8 rolls and cut each unbaked roll into 8 pieces. Place all pieces on the bottom of the buttered pan. 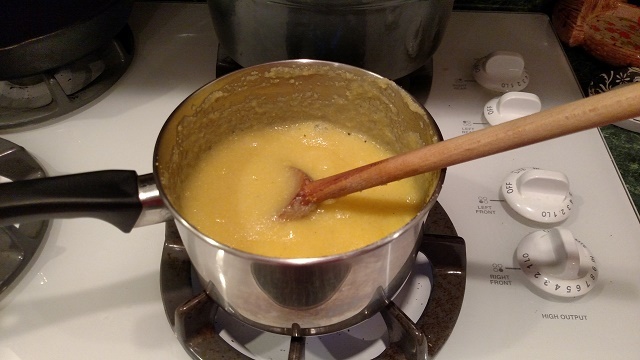 Whisk together 4 eggs and 1 Tbsp milk, 1 tsp. vanilla extract, 1 Tbsp maple syrup. Pour over the dough pieces. Bake about 45-50 minutes until the egg batter is fully set. Drizzle the reserved frosting over the top. Cut into 4-6 pieces and serve with some spicy sausage and strong coffee. Perfect for that January 1st "day after" brunch. Happy Crazy Holiday Season ! This is unquestionably one of the most stressful times of the year—hard emotionally and physically. It's easy to look at your “to do” list and hit the panic button. Worse, it's the time of the year when we neglect our health while we run non-stop between full time jobs and full time shopping and party planning, trying to make everything perfect along the way. 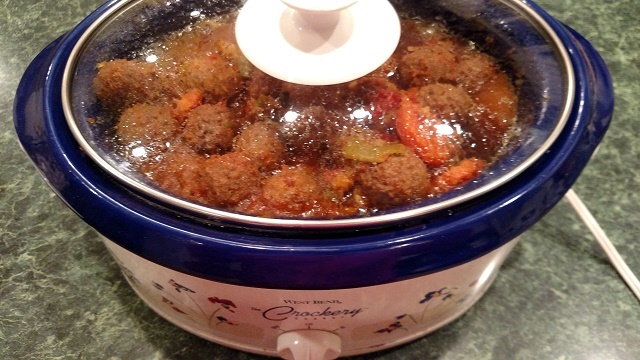 How about a really easy crockpot recipe that you can prepare from good ingredients that are likely in your freezer and pantry right now? 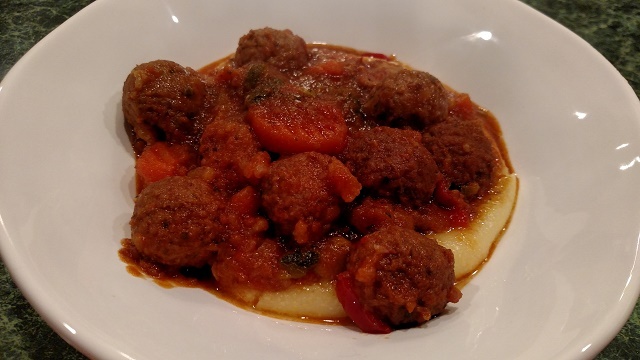 Put this Italian Meatball Stew together, turn the crockpot on “low” and come back 8 hours later to make the polenta (which will take all of 5 miniutes)-- meanwhile, you'll have completed that full time job “to do” list for the day, without sacrificing a healthy dinner, one that's almost upscale-- in a rustic, Italian, pub-grub kind of way. 20 oz bag of frozen Italian vegetable blend—this would be a combination of zucchini slices, Italian flat green beans, carrot slices, red pepper, onions.--you can also make your own blend and even use fresh, if available. 1 pint of Pasta sauce—now I KNOW you have this on your shelf and it may well be homemade, too! Cook all day -8 hours on low. When your three simultaneous full time jobs are done, and you get back home, make the Polenta. It must be made right before you intend to eat or it will turn into a gummy coagulum. 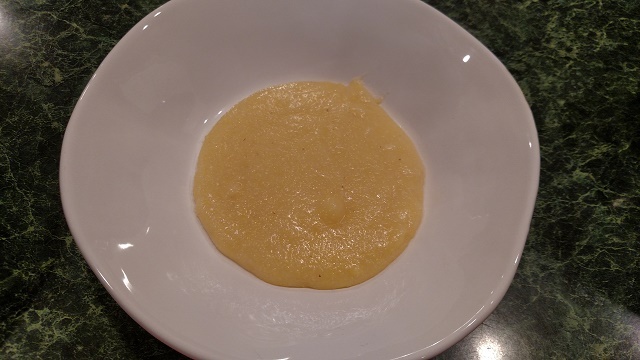 Per serving: 1 cup of boiling water, stir 4 Tbsp polenta. --multiply according to number of servings needed. Cook until thickened for 5 minutes. Then turn the polenta right into the bottom of your chunky stew bowls. You will quickly re-fortify yourself and happily so, ready to face the next day's holiday multi-tasking! Let's Squash this, right now! If your last load from the garden looks something like a bunch of orange, green and yellow things--you have your hard squashes ready for winter. And you will likely need a couple of good ideas for those hard squashes: pumpkin, assorted winter squashes, spaghetti squash, etc. 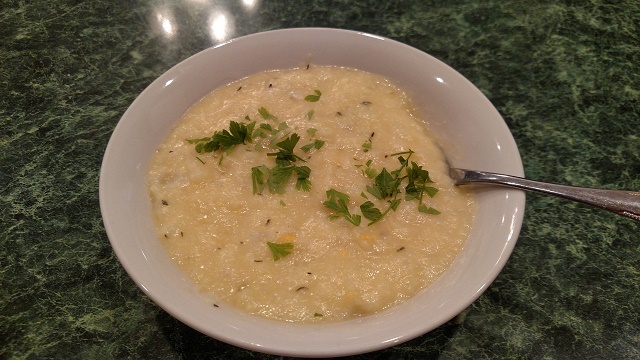 I'd like to share two good recipes for using Spaghetti squash. First, a quick inservice on cooking the squash. I favor poking a couple of holes in the squash with a skewer and baking it in the oven at 350 degrees for 40-60 minutes depending on the size. Bake it until the sides seem “un-firm” to pressure, not really “soft” but compressible to firm finger pressure. If you note, the squash is virtually impenetrable with a knife until it's cooked. After it's baked, you can cut the squash easily through the center. Allow to cool a little, so as not to burn your fingers, then scoop out the seeds. After the seeds are discarded (or saved for the chickens), the flesh comes out in typical spaghetti-like strands. 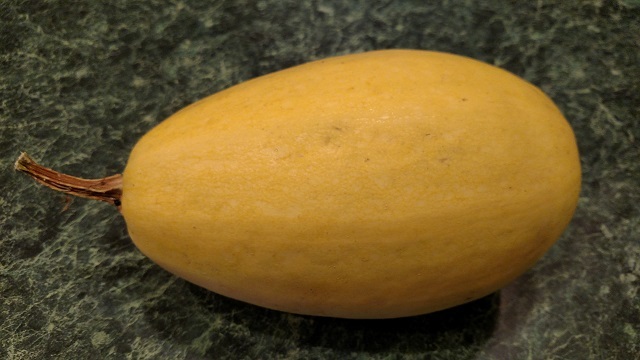 You are then ready to use the cooked squash in your recipes. You can also pat excess water from the squash and freeze in ziplock freezer bags for later use! And remember you do not have to get tricky to have a wonderful vegetable dish. Cooked squash simply buttered and seasoned with salt, pepper and chopped parsley is a wonderfully clean, high fiber, healthy side dish! 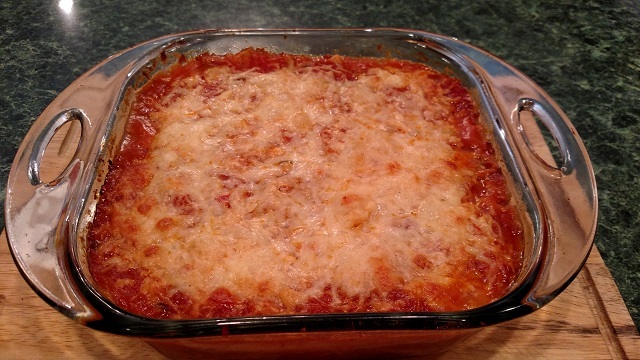 You'll need a casserole dish, one roasted medium sized spaghetti squash, a 16 oz jar of tomato OR Alfedo pasta sauce, 8 oz. Mozzarella cheese. Top with ½ of the pasta sauce and 4 oz. mozzarella cheese. Repeat with remaining pasta sauce and cheese. Bake at 350 degrees about 30-40 minutes until fully heated through and cheese is melted. 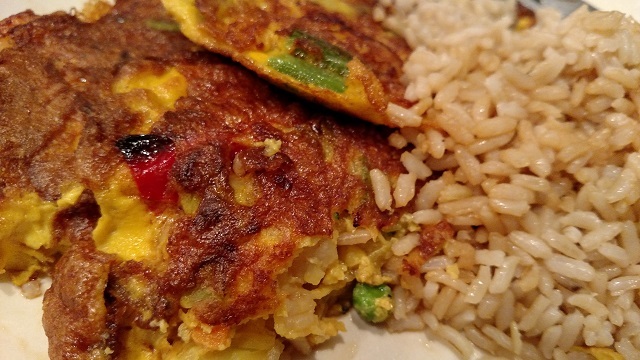 Another Option for Spaghetti Squash might be to substitute it for bean sprouts in EGG FOO Yung. Who doesn't love a healthy version of this classic Cantonese dish? 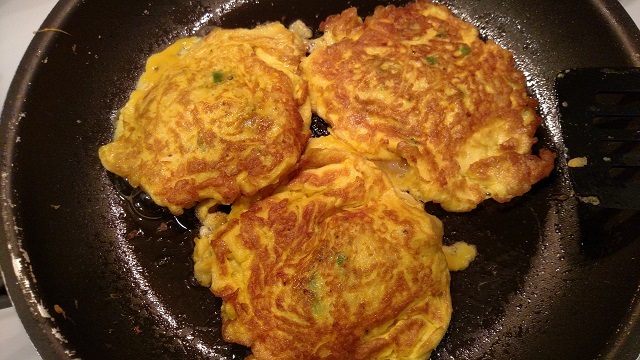 Here's a quick version of EGG FOO YUNG. Add chopped Chinese vegetables -typically snow peas, carrots, green onion, green and red pepper, and optional diced small cooked shrimp. Add about 1 cup of cooked and dry spaghetti squash, which has been cut into smaller pieces. Heat olive oil with a little sesame oil in a skillet. Drop by ladleful and fry, turning once. 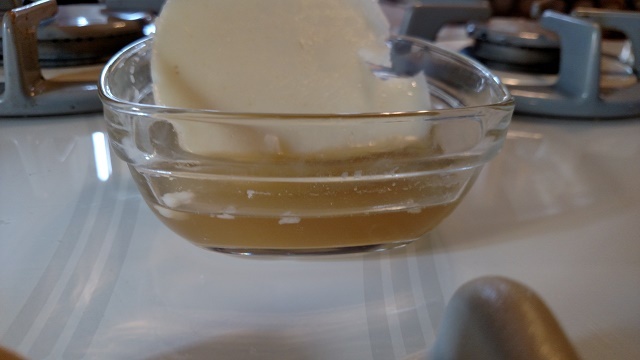 Sprinkle with soy sauce or make a light gravy with chicken broth and cornstarch.